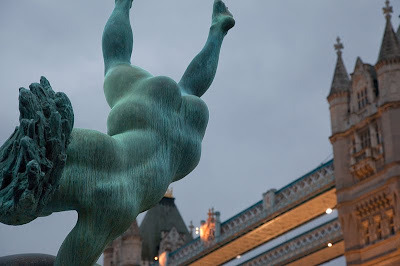 David Wynne's statue of the girl with the dolphin is generally photographed including all of tower bridge and the dolphin (of course). My take on her is as a super woman flying through London skies, having just dived over tower bridge. Look we don't get too many blue skies at this time of the year and it drives us wild with excitement. yes , great angle !!! Excellent - a very neat capture. She looks quite different without her dolphin! Love the image of her jumping over tower bridge you've planted in my mind. Thanks. Ha! this is brilliant. I love it. Great photo, I love the angle! A clever and unexpected angle. She is a bit bumpy in parts but otherwise looks in good shape for skydiving.